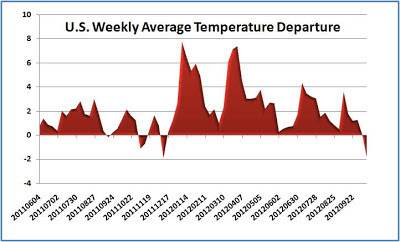 Preliminary data from the National Climatic Data Center (NCDC) show that the temperature for the contiguous 48 states of the U.S. in the week ending October 13 was cooler than average for the first time in 10 months. After 43 consecutive warm weeks, the national average temperature was 1.8° below normal. This also brings the month-to-date temperature for October to -0.9° relative to average. For the week, cool temperatures prevailed in 5 out of 9 climate regions (Northeast, East North-Central, Central, West North-Central, and South). Both the Central and East North-Central were near to more than 5° below average. CapitalClimate analysis of unadjusted data from 215 National Weather Service stations shows that 83% of locations were cooler than average, while only 13% were warmer. 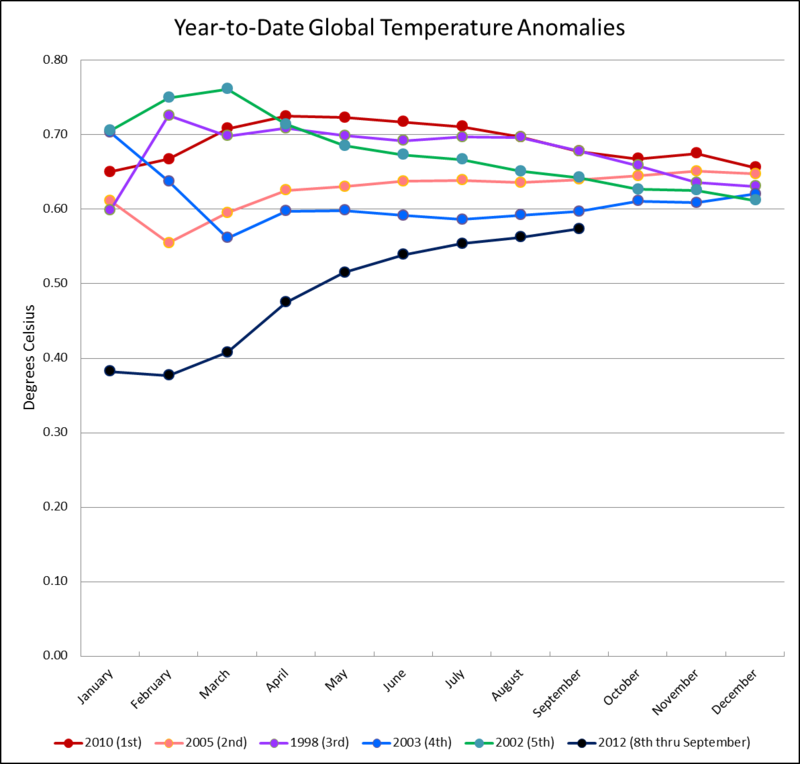 The National Climatic Data Center (NCDC) announced today that the globally averaged land and ocean surface temperature for September 2012 was tied with 2005 as the warmest since records began in 1880. For the year to date, the temperature is the 8th warmest on record. 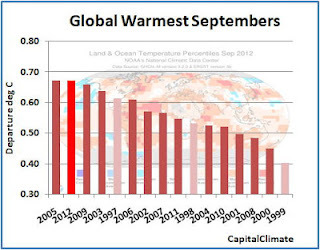 CapitalClimate analysis of NCDC data shows that the temperatures for the last 16 Septembers beginning with 1997 have all been in the top 16 warmest Septembers (see chart). 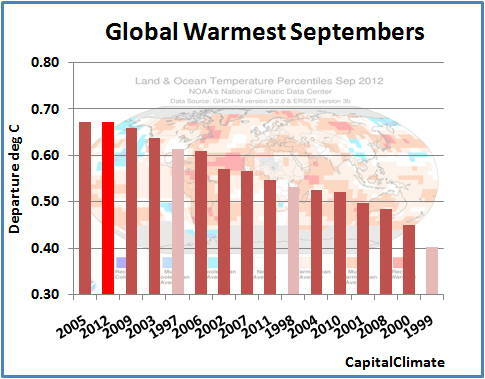 The combined average temperature over global land and ocean surfaces for September tied with 2005 as record highest for September, at 60.21°F (15.67°C) or 1.21°F (0.67°C) above the 20th century average. The margin of error associated with this temperature is ±0.20°F (0.11°C). September marked the 36th consecutive September and 331st consecutive month with a global temperature above the 20th century average. The last below-average September was September 1976 and the last below-average month was February 1985. The global land temperature was the third warmest September on record, at 1.84°F (1.02°C) above the 20th century average of 53.6°F (12.0°C). The margin of error is ±0.45°F (0.25°C). Higher-than-average monthly temperatures were most notable across central Russia, Japan, western Australia, northern Argentina, Paraguay, western Canada, and southern Greenland, while temperatures were below average across far eastern Russia, western Alaska, southern Africa, parts of the upper midwest and southeast United States, and much of China. Record to near-record warmth over land from April to September and increasing global ocean temperatures in the eastern equatorial Pacific Ocean resulted in the first nine months of 2012 ranking as the eighth warmest such period on record, with a combined global land and ocean average surface temperature of 1.03°F (0.57°C) above the 20th century average of 57.5°F (14.1°C). The margin of error is ±0.18°F (0.10°C). 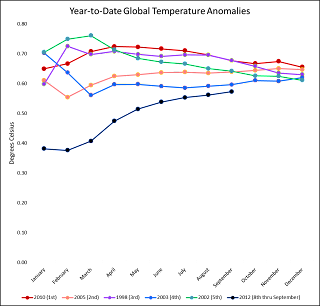 The January–September worldwide land surface temperature was 1.69°F (0.94°C) above the 20th century average, marking the sixth warmest such period on record. The margin of error is ±0.40°F (0.22°C).